Pressed by coastal governors, lawmakers and advocacy groups to explain his exemption of Florida's waters from offshore drilling, Interior Secretary Ryan Zinke this week offered a cryptic clue. "The coastal currents are different, the layout of where the geology is," he said of the Sunshine State in a Sunday interview with CNN. The Interior Department and the Bureau of Ocean Energy Management did not respond to requests for elaboration on Zinke's statement. 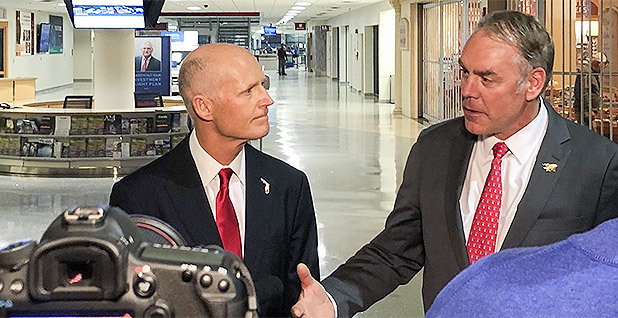 After removing Florida from the five-year plan, Zinke was inundated with meeting requests from state governors along the Atlantic and Pacific coasts. They all sought the same treatment as Florida, which Zinke tweeted that he took out of the plan immediately after a meeting with Gov. Rick Scott (R) (Energywire, Jan. 10). Questions remain as to whether Florida is truly exempt. BOEM acting Director Walter Cruickshank last week told a panel of lawmakers that the secretary's exemption, which came in the form of a tweet, stood on its own and that Florida remained in the bureau's analysis. A proposed program is due later this year. Either way, no other state has received the same assurances Zinke gave to Florida. 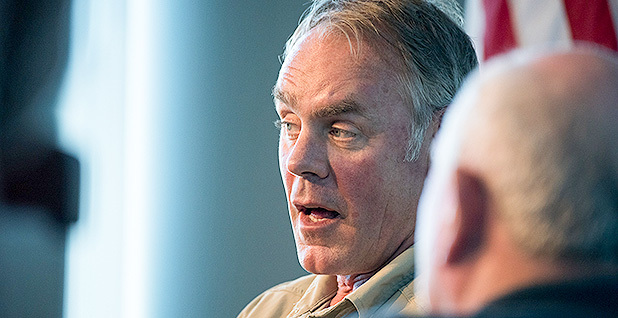 Though he has had phone calls with coastal governors and pledged to schedule visits, the Interior secretary has stopped short of exempting another state from the offshore plan. So what's so special about Florida's currents and geology? E&E News asked oceanographers and offshore geology experts to explain. What do currents have to do with drilling? If there's a spill offshore, ocean currents will determine where the oil goes. Florida is surrounded by a "loop current" that travels through the Gulf of Mexico, down Florida's western coast and up the Eastern Seaboard. There, it joins the powerful Gulf Stream and travels across the Atlantic Ocean and over to Europe. "If there's a spill in the Gulf Stream, it's going to travel along the East Coast, whereas a spill might be contained better in the Gulf of Mexico," said Antonio Rodriguez, a professor of coastal geology in the University of North Carolina's department of marine sciences. Oil spills along the rest of the East Coast, which could be open for drilling under BOEM's next five-year program, could have the same far-reaching impact, Rodriguez said. But spills along Florida's western and southern coasts would be particularly disruptive because of strong channeling effects as the loop current squeezes through the narrow artery between Florida's tip and the Bahamas. Strong ocean currents can also pose difficulties for day-to-day functions on offshore platforms, said Harry Roberts, an adjunct professor at Louisiana State University's department of geology and geophysics. 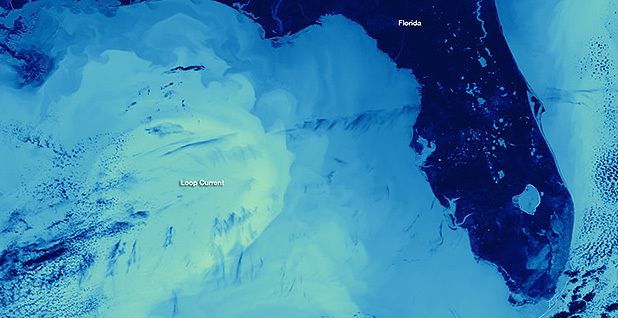 In the eastern Gulf of Mexico, the hairpin turn of the loop current and its powerful eddies can create logistical problems for offshore firms, shutting down production and closing off access to supplies, Roberts said. "It makes operations more difficult," he said. Current research shows that the western cliff of the Florida shelf is the area that holds the most production potential, said Steve Murawski, a fisheries biologist and marine ecologist at the University of South Florida (USF). But that's exactly where the loop current could cause the most havoc, he said. "Any oil spill in the loop current would transport oil rapidly around Florida and up the coast," Murawski said. What's so different about Florida's geology? A few things, ocean experts say. The Florida landmass is just the visible part of the larger Florida platform, a massive carbonate geological feature that, according to current knowledge, contains little oil and gas. 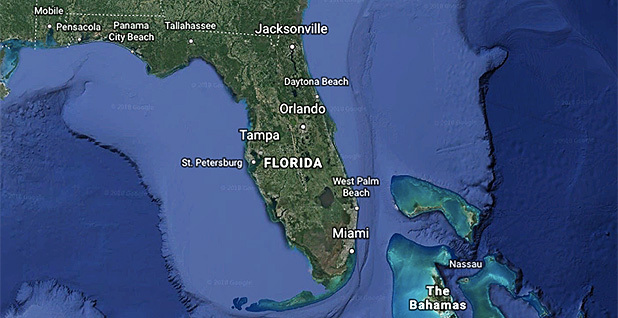 "Florida's just not a hydrocarbon producer," said Albert Hine, an emeritus professor of geological oceanography at USF. "It's not for a lack of trying." Florida actually does produce hydrocarbons, but only onshore and in relatively small quantities. Discoveries were made in South Florida in the 1940s, but the industry never really took off there as it did in other states. According to the federal Energy Information Administration, Florida ranked 23rd of 31 U.S. oil-producing states in 2017, producing 153,000 barrels for the entire year, for an average of a little over 400 barrels a day. Mississippi produced 10 times more. Any spills that might occur in Florida would be tiny and confined to the land. Despite its unfavorable geology compared with other states, Mark Shuster, a former Royal Dutch Shell PLC geologist now with the University of Texas, Austin's Bureau of Economic Geology, says Florida's Gulf region likely holds pockets of significant potential, thus the industry's interest in exploring in its Gulf of Mexico waters. Of the three federal Gulf of Mexico offshore energy leasing planning areas, the Central Planning Area off Louisiana, Mississippi and Alabama hosts the greatest amount of activity. Florida's Gulf waters constitute the Eastern Planning Area, the vast majority of which is currently off-limits to ocean drilling rigs. But that doesn't mean Florida's offshore rocks are without some significant hydrocarbon reserves. "With regards to potential on the Gulf side, there's quite a bit of exploration that's occurred on the farthest east part of the Central Planning Area, and some fairly significant discoveries have been made in what's called the Norphlet play, so Appomattox is a big discovery there and there are a few others," said Shuster. "That's adjacent or very close to the Eastern Gulf of Mexico Planning Area, which includes the Florida waters." Thus, "there's a high likelihood that there's going to be some petroleum potential in the eastern Gulf of Mexico," he added. In Florida's Atlantic waters, little is known about the geology, but the industry is known to be much less interested in drilling east of Florida and more interested in prospecting off the Carolinas. Deep waters off that portion of the coast are underlain by some of the same geological features as the Gulf of Mexico, but those regions are still subject to the rush of the Gulf Stream, said Hine of USF. Zinke's decision to remove Florida from the offshore plan has largely been regarded as a political stunt. Scott, Florida's governor, may run for the Senate seat held by Democrat Bill Nelson. Touting a successful negotiation with the federal government to protect Florida's coasts could be seen as a major campaign bargaining chip. Nelson last week pushed back by blocking three of Interior's long-stalled nominees (E&E Daily, Jan. 18). The Sunshine State is notorious as a swing state in national elections, sometimes playing an outsized role in determining who wins the presidency, as was seen in the 2000 election. Florida's largest industry is tourism, and its greatest draw the beaches and shorelines. Florida Republicans and Democrats alike by and large oppose offshore oil exploration, the one bipartisan compromise they never waver from. Shuster of UT Austin noted the comparison to offshore California, which the oil industry reluctantly wrote off long ago. There still remains untapped energy potential offshore Southern California, with studies in the late 1970s estimating upward of 5 billion barrels of oil to be had. But the political blowback from the 1969 Santa Barbara oil spill has resulted in no new significant offshore exploration in California since those studies were undertaken. Companies can prospect from existing platforms and projects, but those efforts have yielded mixed results, and California has missed the shale oil renaissance almost entirely as the state's oil production continues to steadily decline, as it has since 1985. "There are a number of prospects that were defined and remain undrilled when that area went into moratorium, and a couple discoveries made that were never developed," Shuster said. "I think there's potential, but it just has been very, very difficult for industry to pursue anything there." California, like Florida, has been very successful in keeping ocean rigs away from both state- and federal-controlled waters for decades. California boasts the highest head count in the House of Representatives and the most electoral votes during presidential elections. Ultimately, as BOEM acting Director Cruickshank's comments on Capitol Hill appear to indicate, Zinke's promises to Florida may be more symbolic than substantive. The Miami City Commission yesterday passed a resolution to oppose drilling off Florida's shores. "Despite Secretary Zinke's tweet, Florida's coastline will not be safe until the Trump administration fully reverses course on this rash and ill-informed proposal," said Salome Garcia, Oceana's South Florida campaign organizer.